This is a rendering of the proposed SkyRise tower. Miami developer Jeff Berkowitz is putting together a proposal to build a sky-scraping observation tower in downtown Miami. The SkyRise Miami tower would stand 1,000 feet tall at the Bayside Marketplace. The Miami Herald's Andres Viglucci reports the Arquitectonica-designed structure would be built to withstand hurricane-force winds. 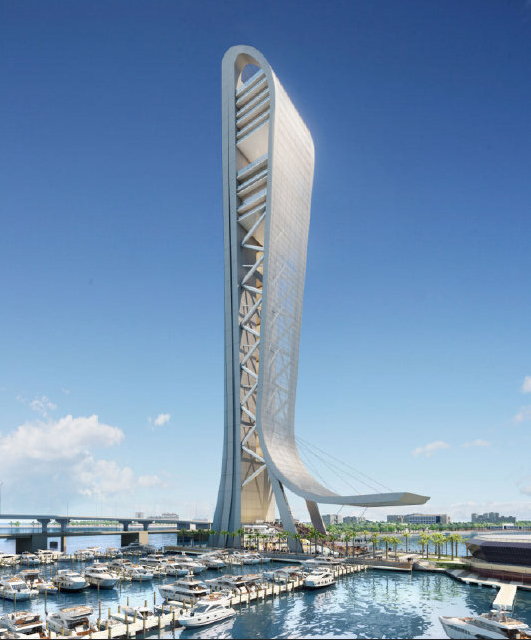 Curbed Miami's Sean McCaughan notes the tower's industrial design would align with surrounding structures such as the port of Miami, and bear a built-in restaurant, nightclub and movie theater. Under construction during most of the 1960s, Interstate-95 ripped right through the heart of Overtown. Thousands of homes were torn down. Instant slums were created as the concrete expressway ripped apart the neighborhood's cultural, economic and education connections. The result is the Overtown that's visible today -- the Overtown that's still trying to recover. "[I-95] caused great harm in the past," says Miami-Dade County Mayor Carlos Gimenez. "We need to rectify that." So, let the rectification begin. Magnolia North is the new name for an area in Opa-locka, which was formerly dubbed The Triangle and known for drugs and crime. Now city leaders hope Magnolia North will be known for galleries and studios and become the next vibrant arts district in South Florida.